Fans and foes of Obamacare jockeyed for position outside the Supreme Court Wednesday. Inside, the justices weighed arguments in the case of King v. Burwell, which challenges a key part of the federal health law. The challengers hinge their argument on six words in the 1,000-plus-page law. Those words stipulate that for people who cannot afford health insurance, subsidies are available through "an exchange established by the state." Only 16 states run their own exchanges. The federal government runs the exchanges for the remaining 34 states that opted out of running their own. Representing the challengers was lawyer Michael Carvin, whose florid-faced passion prompted Justice Sonia Sotomayor to tell him gently at one point, "Take a breath!" Carvin took incoming shots from all of the court's more liberal members. Justice Stephen Breyer noted that the statute says that if a state does not itself set up an exchange, then the federal "Secretary [of Health and Human Services] shall establish and operate such exchange." "Context matters," added Justice Elena Kagan. And "if you look at the entire text, it's pretty clear that you oughtn't to treat those five words in the way you are." Justice Sotomayor, looking at the law through a different lens, asked how the challengers' reading of the law would affect the federal-state relationship. "The choice the state had was, establish your own exchange or let the federal government establish it for you," she said. "If we read it the way you're saying, then ... the states are going to be coerced into establishing their own exchanges." With all eyes on Justice Kennedy, he seemed to agree with Sotomayor's point. It does seem "that if your argument is accepted," he told Carvin, "the states are being told, 'Either create your own exchange, or we'll send your insurance market into a death spiral.' " By "death spiral," Kennedy was referring to the consequence of having no subsidies in 34 states, leading to a collapse of the individual insurance market. That, Kennedy suggested, is a form of coercion. So "it seems to me ... there's a serious constitutional problem if we adopt your argument." Justice Antonin Scalia, a leader of the court's conservative wing, jumped in to help Carvin. "Do we have any case which says that when there is a clear provision, if it is unconstitutional, we can rewrite it?" Scalia asked. Justice Ruth Bader Ginsburg, however, pointed to what she called the familiar patterns of federal aid, in which the federal government says to the states: Here's a grant; take it or leave it. Or, a pattern like the one at issue here, which says to a state, "you can have your program if you want it, and if you don't," the fallback is a federal program. But, said Ginsburg, "I have never seen anything" such as you are suggesting, where a state's failure to set up a program results in "these disastrous consequences." If Carvin got a hostile reception from the court's liberals, Solicitor General Donald Verrilli Jr. got equal treatment from some of the court's conservatives. "Is it not the case," asked Scalia, "that if the only reasonable interpretation of a particular provision produces disastrous consequences in the rest of the statute, it nonetheless means what it says? Is that true or not?" Verrilli replied that it isn't just a question of onerous consequences, but that the states had no notice of disastrous consequences when they chose to let the federal government run the state exchanges. "It's not too late for a state to establish an exchange if we adopt" the challengers' interpretation of the law, interjected Justice Samuel Alito. "So going forward, there would be no harm." Verrilli replied that the tax credits would "be cut off immediately," and millions of people in many states would be unable to afford their insurance. Even if the court were to somehow delay the effect of its ruling for six months, it would be "completely unrealistic" to set up the exchanges by May of this year, as required by law, so that they could begin operating in 2016. "You really think Congress is just going to sit there while all of these disastrous consequences ensue?" asked Scalia. How often have we come out with a problematic decision and "Congress adjusts, enacts a statute that takes care of the problem. It happens all the time. Why is that not going to happen here?" Verrilli paused, eyebrows raised. "This Congress, your honor?" he asked, as laughter filled the courtroom. Justice Kennedy once again raised the question of the federal government impinging on state sovereignty. That's why our reading is far preferable, replied Verrilli. If a state doesn't want to participate, it can "decide not to participate without having any adverse consequences visited upon the citizens of the state." Chief Justice Roberts, who remained quiet through most of the argument, finally had this question: If we decide the language of the law is ambiguous and we thus defer to the administration's interpretation, he asked, could the next administration "change that interpretation?" Some court observers thought that comment set a way out for the chief. But by the end of the argument, nobody was making any predictions. 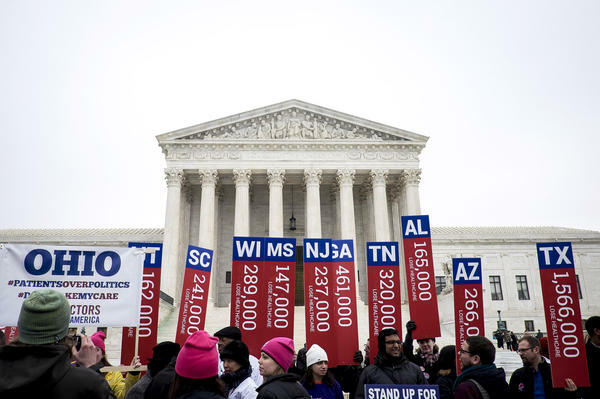 The Supreme Court justices were sharply divided today during a sometimes emotional argument over the fate of President Obama's health care law. In 2012, the court upheld the law as constitutional by a 5-to-4 vote. Today, opponents made a different argument based on the wording of the statute. NPR legal affairs correspondent Nina Totenberg reports. 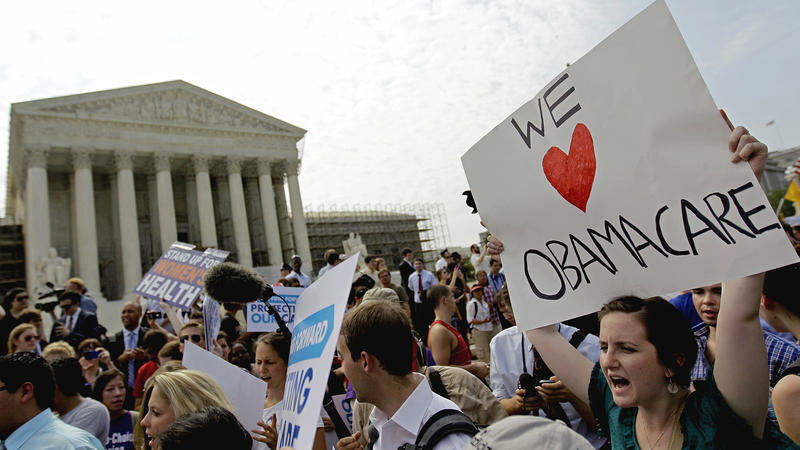 NINA TOTENBERG, BYLINE: ...Outside on the Supreme Court Plaza, there were folks opposed to Obamacare and folks like Claudette Newsome from Texas who said her husband died because the family couldn't afford insurance. CLAUDETTE NEWSOME: He probably would've still been here today if we had health insurance. Now it is affordable, so there's another woman out there with a husband with an illness that she can go get health insurance for and he can go to the doctor now. TOTENBERG: But there were vehement opponents of the law, too, like Iowa congressman Steve King. CONGRESSMAN STEVE KING: This law doesn't allow the federal government to set up exchanges. And if this court should decide that the wish of the president trumps the will of the people, we've got a problem. TOTENBERG: Inside the courtroom, the argument was more focused. The challengers hinged their argument on six words in the thousand-plus page law. Those words stipulate that for people who cannot afford health insurance, subsidies are available through, quote, "an exchange established by the state." Only 16 states run such exchanges, while the federal government runs the exchanges for the remaining 34 states who opted out of running their own. By the end of the argument, it was clear that the outcome will almost certainly be determined by Chief Justice John Roberts and Justice Anthony Kennedy. The chief justice said almost nothing during the argument, and Kennedy sent mixed signals. Judging by the comments from the remaining justices, the challengers would need the votes of both Roberts and Kennedy to win. Representing the challengers was lawyer Michael Carvin, whose red-faced passion prompted Justice Sotomayor to tell him gently at one point, take a breath. Carvin took incoming shots from all the court's more liberal members Justice Breyer - the statute says that if a state does not itself set up an exchange, then the federal secretary of health and human services shall establish and operate such an exchange. Justice Kagan - context matters, and if you look at the entire text, it's pretty clear you oughtn't to treat those five words the way you are. Justice Sotomayor - the choice the state had was, establish your own exchange or let the federal government establish it for you. If we read it the way you're saying, then the states are going to be coerced into establishing their own exchanges. With all eyes on Kennedy, he seemed to agree. It does seem to me that if your argument is accepted, the states are being told, create your own exchange or we'll send your insurance market into a death spiral where insurance will become unaffordable for almost everyone in the individual market - that, Kennedy suggested, is a form of coercion, so it seems to me there's a serious constitutional problem if we accept your argument. Justice Scalia, a leader of the court's conservative wing jumped in at this point to help Carvin. Do we have any case which says that when there's a clear provision, if it's unconstitutional, we can rewrite it? Justice Ginsburg, however, pointed to what she called the familiar patterns of federal aid. Here's a grant - take it or leave it - or a pattern like this, which says to a state, you can have your program if you want it, and if you don't, the fallback is a federal program. But, said Ginsburg, I have never seen anything such as you're suggesting where a state's failure to set up a program results in these disastrous consequences. If Carvin got a hostile reception from the court's liberals today, Solicitor General Donald Verrilli got equal treatment from some of the court's conservatives. Justice Scalia - is it not the case that if the only reasonable interpretation of a particular provision produces disastrous consequences, it nonetheless means what it says? Is that true or not? Verrilli replied that it isn't just a question of onerous consequences, but that the states had no notice of disastrous consequences if they chose to let the federal government run their exchanges. Justice Alito - it's not too late for a state to establish an exchange if we adopt the challenger's interpretation of the law, so there'd be no harm. Verrilli replied that tax credits would be cut off immediately, and millions of people in many states would be unable to afford their insurance. Even if the court were to somehow delay the effect of its ruling for six months, he said, it would be completely unrealistic to set up the exchanges by May of this year, as required by law, so that they could begin operating in 2016. Justice Scalia - you really think Congress is just going to sit there while all these disastrous consequences ensue? How often have we come out with a problematic decision and Congress adjusts - enacts a statute that takes care of the problem? Why is that not going to happen here? Verrilli paused, eyebrows raised - this Congress, your honor? Justice Kennedy once again raised the question of the federal government impinging on state sovereignty. Replied Verrilli, that's why our reading is far preferable. If a state doesn't want to participate, it can decide not to participate without having any adverse consequences visited upon the citizens of the state. Chief Justice Roberts - if we decide the language of the law is ambiguous and thus we defer to the administration's interpretation, could the next administration change the interpretation? Some court observers thought that comment set a way out for the chief, but by the end of the argument, nobody was making any predictions. Nina Totenberg, NPR News, Washington. Transcript provided by NPR, Copyright NPR.